(Jupiter, FL - April 29, 2009) - In-O-Vate Technologies, Inc, makers of the popular Dryerbox®, announced the addition of a large radius 45 degree elbow to their lineup of Dryer-Ell venting products. Similar to the Dryer-Ell 90, this new elbow will allow contractors to gain additional length of run with no resulting building code penalty. Last September, voting members of the International Code Council (ICC), the leading body in building code development, recently adopted a new table granting equivalent length for large radius dryer exhaust duct fittings. The table is published in both the 2009 International Mechanical Code (IMC) and 2009 International Residential Code (IRC). 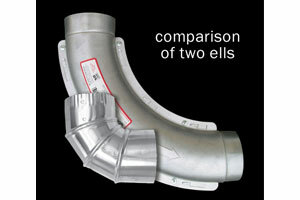 The Dryer-Ell line is engineered with a 10” radius, allowing duct measurements equal to straight pipe. With the addition of the new table, contractors will now be able to vent the full run length when the Dryer-Ell is used in conjunction with the Dryerbox®. Other major changes included an increase in maximum distance to 35 feet from 25 feet. Due to their airflow restrictiveness, standard 4” mitered elbow turns of 90 degrees and 45 degrees are still penalized the same, respectively at 5 feet and 2.5 feet. The new angled elbow offers contractors more flexibility when installing ductwork through truss and joist systems. The Dryer-Ell is a cost effective alternative to a booster fan and can provide for a better location of the vent termination. 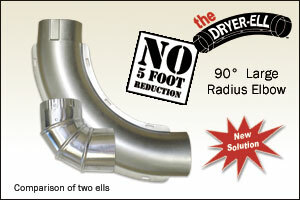 The Dryer-Ell is available through over 1500 HVAC supply houses or online at www.dryer-ell.com. (Jupiter, FL - January 22, 2007) Jupiter, FL - January 22, 2007. In-O-Vate Technologies, the manufacturer of the Dryerbox and the Dryer-ell, have recently been notified that both products have been “GreenSpec” listed and can assist a builder in gaining LEED (Leadership in Energy and Environmental Design) building credits under the U.S. Green Building Council's (USGBC) Homes Program Pilot Rating System. With the installation of the Dryerbox a project can qualify for two USGBC LEED credits. One for optimizing energy performance and one for innovative design features. Making use of the Dryer-Ell (dramatically improved airflow efficiency) can contribute one credit for optimizing energy performance. For the builder, getting your project awarded Silver, Gold, or Platinum certification requires a building project to meet certain prerequisites and performance benchmarks ("credits") within each category. This comprehensive approach is the reason LEED-certified buildings have reduced operating costs, healthier and more productive occupants, and conserve our natural resources. Each “green” product the builder uses plays a role and can help projects with credit achievement. Building “green” catches the attention of the environmentally responsible consumer. These are consumers seeking a healthy, sustainable lifestyle. These green building materials preserve health, the environment, and whose manufacture processes promote social equity and economic sustainability, says the U.S. Green Building Council. The Dryerbox is a simple UL classified metal receptacle that collects the flex exhaust hose neatly and safely behind the dryer. Known for its record of making homes safer, more efficient and more spacious, the Dryerbox is already installed in over 1.4 million homes. Its popularity with builders is due, in part, to the fact it helps minimize service calls and it eliminates one elbow which effectively gains five feet of duct run under most building codes. The Dryer-Ell is a re-engineered metal dryer exhaust fitting that exhibits a larger radius and a smooth interior, providing a net gain of approximately 4.5 feet in allowable duct length when used as a replacement to the standard 4” ell currently used in the dryer venting trade. In-O-Vate Technologies commissioned a 2006 Underwriters Laboratories Fact Finding Report that showed a 500% improvement in airflow versus the old, standard 4" radius 90-degree, five sectioned elbows. For the tradesmen and the general contractors, this is a huge benefit, as the 25 foot length restraint is very restrictive and limits their options for proper or aesthetic terminations. Currently builders account for the longer duct run distances by adding a dryer booster fan. Besides being expensive, they become a huge bottleneck in the conduit when they malfunction or stop running. They are generally located in crawlspaces and attics with minimal access. “The new long-turn Dryer-ell from In-O-Vate appears to be a breakthrough product for an industry struggling for a solution in addition to a 500% improvement in airflow.” Says Rick Harpenau, the inventor. We found both of these online at www.dryerbox.com and www.dryer-ell.com for less than $23. About GreenSpec: GreenSpec is BuildingGreen's premiere product information service. It contains detailed listings for more than 2,100 environmentally preferable building products with descriptions, manufacturer information, and links to additional resources. About Leadership in Energy and Environmental Design (LEED): Their Green Building Rating System™ is the nationally accepted benchmark for the design, construction, and operation of high performance green buildings. LEED gives building owners and operators the tools they need to have an immediate and measurable impact on their buildings’ performance. (Jupiter, FL - September 7, 2006) Jupiter, FL - November 21, 2006. In-O-Vate Technologies, the manufacturer of the Dryerbox, has introduced a new, patent pending feature for their popular vent hose receptacle. The Dryerbox will now include a duct support tab in the top port that assists in maintaining the ideal penetration length of 2 inches for Snaplock rigid conduit. The installer simply creates a “hook” by bending the innovative tab at the two scored locations. At that point, the installer sets in the length of Snaplock pipe and continues with the balance of the duct run with minimal worry that the duct is too far into the receptacle. After the duct run is complete and the pipe supported, the contractor simply breaks away the temporary support tab. In the past, contractors may have allowed the rigid exhaust conduit to protrude further into the box than the instructions intended. In that case, the receptacle does not provide sufficient height or space to facilitate the proper recoiling and storage of the flex transition hose. Ideally, the rigid pipe should only protrude two inches into the Dryerbox. This provides adequate vertical height to collect the flex transition hose. “Introduction of the pipe support tab has been well received by HVAC contractors across the country,” reports James Ortiz, Director of Distribution for In-O-Vate Technologies. The new tab feature will start appearing on Model 425 Dryerboxes in the 4th quarter of 2006 through over 1,500 HVAC supply houses across the United States. According to company president, Rick Harpenau, the model 350 for 2x4 walls, will also feature the support tab but will be available after March of 2007. (Jupiter, FL - September 7, 2006) In-O-Vate Technologies, the company that invented the Dryerbox®, made this year’s Inc. 500 as one of the fastest growing private companies in America. In-O-Vate exceeded 388% growth over the three-year period reviewed, ranking 359th overall and 16th in the construction related category. In-O-Vate Technologies is focused on the development, manufacturing and marketing of dryer venting products. The Dryerbox®, a receptacle installed behind the dryer to facilitate the connection and collection of the flex exhaust hose was the company’s first entry into the market, and it remains the primary driver of growth. It is estimated that over 1.4 million homes have the Dryerbox® receptacle installed. Currently, one out of three new homes will have one installed by the heating and air conditioning subcontractor. The Dryerbox® retails fo about $21, is Classified by Underwriters Laboratories and has won over seven awards. About In-O-Vate Technologies, Inc.: Based in Jupiter, FL, In-O-Vate Technologies designs, markets and manufactures innovative new products. The family of products invented include The Dryerbox®, The Downbox™, The Dryer-Ell™ and LintAlert™ boasting annual sales in excess of $5 million. (Jupiter, FL -August 2006) In-O-Vate Technologies’ new 90° long-turn dryer venting elbow was recognized for excellence in product design in the third annual Dealer Design Awards Program sponsored by The Air Conditioning Heating & Refrigeration News magazine. An independent panel of 45 contractors acted as judges in the contest that had 112 entries from 75 manufacturers. The Dryer-Ell took top honors with a Gold Award for ventilation products. In their decision, the panel of judges noted that this new dryer venting elbow is a “great idea” that will “really help contractors out in new construction dryer venting.” Its innovative design removes the 5-foot reduction consequence found in most building codes for standard 90° turns (based on American Society of Heating, Refrigerating and Air Conditioning Engineers methodology for calculating friction loss). And, the 2006 IRC has adopted the advantage of its longer turn radius thus crediting the ventilation subcontractor five feet of duct run under section M1502.6. One Judge was heard to say, “I wish I would have thought of this.” The Dryer-Ell reclaims allowable duct length. Winning entries in the Dealer Design Awards were featured in the July 17, 2006 issue of The ACHR News, which is distributed nationally to over 32, 000 HVACR contractors, wholesalers, and other industry professionals. The ACHR News Publisher John Conrad stated, “This product design competition gives us the opportunity to recognize outstanding innovations that make a dealer’s job easier and faster. The larger radius and smooth interior of the Dryer-Ell increases dryer efficiency, and— when replacing a restrictive 3” radius elbow to reclaim duct length—it can be used as an alternative to expensive booster fans. For total dryer venting systems, it nicely complements the Dryerbox® which is the first invention the company brought to market in 1994. 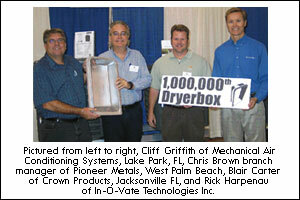 (Jupiter, FL -March 2006) In-O-Vate Technologies, Inc. of Jupiter, FL announced the sale of the one millionth Dryerbox unit. Rick Harpenau, owner of In-O-Vate orchestrated the pass through of product from manufacturer to tradesman at the Palm Beach ACCA show on March 7, 2006 at the South Florida Fairgrounds. Harpenau invented the idea in 1993, while he was the owner of Marlin Construction in the SE Florida area. He had a local sheet metal shop fabricate a metal receptacle that he used to facilitate the connection and collection of the dryers exhaust flex hose in a spec home he was building. Today it is known as the Dryerbox®, a UL Classified metal receptacle that allows the clothes dryer to be pushed back against the wall of a laundry room without the fear of kinking the exhaust hose. By eliminating the bends in the flex exhaust hose, the dryer has a less restrictive airflow, which in turn minimizes lint buildup, saves energy costs and reduces the serious fire hazard caused by lint buildup. "As builders, architects, inspectors, subcontractors and homeowners see the product for themselves; they are asking why this wasn't available sooner. It really is a common sense type of product," Harpenau said. For additional information, contact Rick Harpenau at (888) 443-7937 or visit www.dryerbox.com. How many is 1,000,000 Dryerboxes? Over 331 miles of Dryerboxes if laid end to end. A 6 hour trip from Miami to Jacksonville. Or 112 stacks of cartons as high as the Empire State Building. Or 1700 feet higher than Mount Everest if stacked in pallets. Or weighing more than 6 fully loaded 747 jumbo jets or 18 steam locomotive engines. (Jupiter, FL - March 2006) In-O-Vate Technologies, Inc., a manufacturing company specializing in dryer venting products, recently unveiled the Lint-Alert, an electromechanical pressure switch to be installed in the dryer appliance. Collaborating with World Magnetics of Michigan, the DesignFlex pressure switch mates with In-O-Vate’s specially designed pitot tube receptor that slides and snaps into place in the dryer’s exhaust conduit. Measuring the pressure differential within the clothes dryer exhaust conduit and atmosphere, the device will detect and notify the appliance user of any blockage. The U.L. approved switch would be an OEM component installed in the exhaust conduit of the dryer near its exit. The switch exhibits a contamination-free pitot tube pickup and a creative design that allows for a slide-n-snap insertion. At approximately .91 water column inch (wci), the switch would trigger an audible or visual alert on the control panel that maintenance or attention should be directed to the exhaust conduit of the dryer. 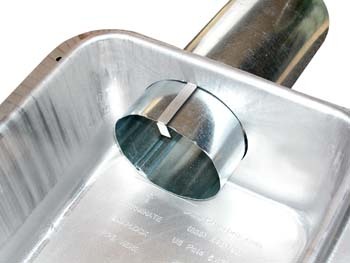 Potential maintenance issues include the buildup of lint due to the condensation and moist air in the pipe, the potential of the flex being crushed or kinked creating a “bottleneck” situation, bird or rodent nests near the exhaust termination cutting off air flow, screens within the termination hoods allowing lint to accumulate over time and inoperative dampers. “This brand new and recently patented pressure differential switch is a common sense innovative safety device that has huge potential in saving lives and property,” said Rick Harpenau, the inventor. The U.S. Consumer Product Safety Commission estimates that 15,500 clothes dryer fires occur in U.S. homes annually, averaging about 10 deaths and 300 injuries and $85 million in direct property damage. In 30 percent of the cases, lack of maintenance was the leading cause of these fires. “The dryer is a common and frequent ignition source in household fires. Property damage, injuries, fatalities, insurance costs could all be reduced with this simple inexpensive product,” Harpenau said. The new module has recently been introduced to all the major appliance manufacturers and is available now. About In-O-Vate Technologies: In-O-Vate Technologies, Inc., located in Jupiter, FL, is a manufacturing company focused on the development, manufacturing, and marketing of dryer venting products. With four patents issued and others pending, the building industry has benefited from In-O-Vate’s commitment to innovation, quality, and customer service. (Jupiter, FL -March 2006) Take a look behind your dryer. Chances are the back of it is about five or six inches away from the wall and the vent hose resembles a snake. The Dryerbox® from In-O-Vate Technologies is a simple metal receptacle that installs in the wall behind the dryer in new construction that facilitates the connection and collection of the flex transition hose. Not only does The Dryerbox® make the appliance run more efficiently, make the laundry room appear larger, and reduce the fire hazard caused by inadequate ventilation, but now has recently been noted to reduce a potential mold source found in the wall directly behind the dryer. Rick Harpenau, owner and inventor, says that in many typical installations, the sectioned elbow installed in the wall directly behind the dryer commonly gets kicked and nudged by the balance of the tradesmen that complete the home. The elbows’ sections will experience enough deformation that they can possibly fall apart or allow the moist exhaust air to escape into the dark cell of the wall. “Being in the business for ten years, I’ve come across numerous dryer hazards. The dryer is a common and frequent ignition source in household fires, and lint is a component of a Boy Scouts fire-starter packet,” says Harpenau. With mold prevention high on builders and homeowners lists of precautions, it’s wise to point out this newly discovered mold potential. The Dryerbox® eliminates that typical elbow and prevents the homeowner from squishing or kinking the flex hose. (Jupiter, FL - February 2005) In-O-Vate Technologies, Inc. adds some serious marketability to its already popular solution to dryer venting by obtaining a one-hour F rating from United Laboratories, Inc. UL is the trusted source across the globe for product compliance. Their Standards for Safety are essential to helping insure public safety and confidence, reduce costs, improve quality and market products and services. All four models of the Dryerbox have been tested and approved to be installed in wood or metal frame construction of 2x4 or 2x6 sizes. “This is a huge advantage for us and for our customers who locate the dryer against a one-hour rated wall, which is typically found in multi-family homes or at the wall between the garage and living area,” said Rick Harpenau, the inventor of the Dryerbox. This simple product saves space in the laundry room, allows the dryer to operate more efficiently and reduces a common household fire hazard. To-date, over 750,000 units have been installed in homes across the country. The popularity of using a receptacle to house and collect the flex dryer hose in the cell of the wall has grown remarkably over the past several years. The Dryerbox allows the clothes dryer to be pushed back against the wall of a laundry room without the fear of kinking the exhaust hose. “As builders, architects, inspectors, subcontractors and homeowners see the product for themselves; they are asking why this wasn’t available sooner. It really is a common sense type of product,” Harpenau said. (Jupiter, FL - February 2005) In-O-Vate Technologies, Inc. makers of the enormously popular and practical Dryerbox have come up with another promising new product: The Dryer-Ell. A re-engineered dryer exhaust fitting that exhibits a larger radius and a smooth interior, providing a net gain of approximately 4.5 feet in allowable duct length when used as a replacement to the standard 4” ell used in the dryer venting trade. Based on accepted ASHRAE methodology for calculating friction loss in ducts and fittings, this new fitting will provide key benefits to the builder and tradesmen by removing the 5 foot reduction consequence found in all building codes. (Jupiter, FL - November 2004) In-O-Vate Technologies introduced a new version of their popular Dryerbox™ vent receptacle facilitating a downward exhaust direction. For houses built on stem wall or for second floor laundry rooms, this new Down-Box receptacle provides all the same benefits of their original model. The simple, yet innovative, product saves space in the laundry room, allows the clothes dryer to operate more efficiently and reduces a common household fire hazard. To date, over 750,000 of their original units are installed in homes across the country. The popularity of using a receptacle to house and collect the flex dryer hose in the cell of the wall has grown remarkably over the past several years. The Dryerbox™ allows the clothes dryer to be pushed back against the wall of a laundry room, providing an additional square foot of work space and it allows the dryer to be positioned without fear of kinking the exhaust hose. (Jupiter, FL - November 2004) It’s time to air some of your home’s dirty laundry. Even the best-kept house may have a dirty little secret. Lint. It’s more than a matter of cleanliness, but actually a serious fire hazard that may be lurking right under your roof. The lint build-up from your dryer may actually be putting you, your family and your home at serious risk. Odds are that behind your dryer lives a snake-like coil of ventilation tubing. What most people don’t give much thought to is that the bends and crimps in this ductwork creates a trap for all the lint that makes its way past your dryer’s internal lint screen. This lint accumulation reduces air flow from the dryer, causing overheating of the exhaust system. Consider the fact that this lint is highly combustible and you can see that these conditions are ripe for fire. While the first victim of this lint accumulation problem may be your dryer (which may be become burnt out from the strain and eventually fail), the more serious issue is that the accumulation of lint will cause a smoldering fire in the exhaust line before homeowners have even become aware of the hazard. More than $65 million in property damages and 10 deaths each year can be linked to dryer fires. This is a serious (and avoidable) risk that consumers need to address. Through simple preventative maintenance and an inexpensive new product now on the market, homeowners can make their homes significantly safer for their families. Bends in dryer ducts pose hidden fire danger. Clothes dryer is a leading cause of house fires, did you know? According to the National Fire Protection Agency (NFPA), clothes dryers are the number three cause of house fires after stoves and heaters. The Consumer Product Safety Commission reports that lint accumulated in dryer ventilation systems cause 15,500 fires annually. The National Association of State Fire Marshals reports that lint is highly combustible. It accumulates easily and ignites quickly, causing fires that can spread from the dryer to your home in seconds. The NFPA also reports that four out of seven home fires occur between December and February. Check for lint clogs in the exhaust tubing and vacuum behind your dryer regularly. Don’t allow lint to pile up on the lint screen — clean after every load. If you realize your dryer is taking longer to dry your clothes or if the exterior feels very hot, it could be a sign that it is working too hard because of significant lint build-up. Avoid running your dryer when you are sleeping or are away from home in case a fire should start. Consider installing a Dryerbox recessed vent box to eliminate lint-collecting bends in the exhaust tubing behind your dryer . Why did you come up with this invention? As a General Contractor for 13 years, building custom homes and developing residential communities, I've always been around and cherished construction, engineering and inventing. Growing up with 7 other brother and sisters, I would jump on the opportunity to take things apart and rebuild them or manage to fix anything that was broken in the house. How did you come up with this particular idea? I remembered the day I scribbled a rough napkin drawing of what is now called The Dryerbox. It was an idea that would eventually take care of the annoying, space consuming and hazardous situation that exists behind almost everyone's washer and dryer. The Dryerbox is a simple metal receptacle that installs between the studs in new construction behind the dryer and facilitates the collection and housing of the flex exhaust hose. A to-the-trade price is approximately $18-20 ea. One of the obvious benefits is the ability to locate the dryer appliance right up against the wall without the potential of squishing or kinking the hose. Moving both appliances back provides close to two additional square feet of living area. Without the likely restrictions in the flex transition hose, clothes dry quicker saving $6/yr in energy costs and tumble less providing less wear to the garments. Who benefits from this innovative product? (Jupiter, FL - October 2004) Have a washer and dryer at home? Good chance the dryer is five or six inches away from the back wall and the flex exhaust hose resembles a snake. “Tight bends in the flex exhaust hose accelerate lint accumulation and can really impair the efficiency of the dryer and—worse yet—create a fire hazard,” says Rick Harpenau, owner of In-O-Vate Technologies Inc. and inventor of The Dryerbox. 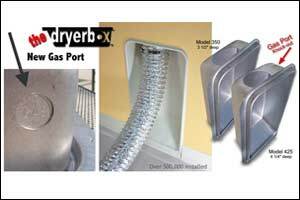 The Dryerbox is a simple metal receptacle about the size of a kitty-litter pan, which installs between the studs in new construction behind the dryer and facilitates the collection and housing of the flex exhaust hose. It provides a net gain of one square foot of living area and close to $6 per year in electricity or fuel savings. It also allows the dryer to be positioned without fear of kinking the exhaust hose. The Dryerbox allows the storage and recoiling of the flex transition hose between the dryer and the wall connection to take place inside the wall cavity, eliminating the zig-zag of ductwork most households have tolerated for decades. 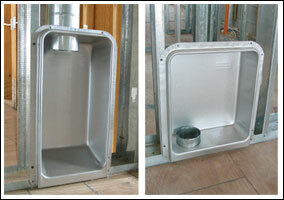 Model versions include depths for 2"x4" or 2"x6" walls and for an upward direction of exhaust flow and a downward. DESCRIPTION: The Dryerbox was invented and patented in the United States and was introduced to the market in 1995. The Dryerbox is a simple metal receptacle that installs in the wall behind the dryer to house and collect the flex duct hose, which connects to the wall exhaust pipe. The Dryerbox eliminates kinks or bends in the transition hose and allows the dryer to be pushed closer to the wall, thereby allowing for more usable space in the laundry room and minimizing the fire danger. The Dryerbox is made of heavy, 22-gauge, aluminized, steel-molded construction and installs between the studs before the drywall in new construction. A Retro-Fit model is also available for existing homes. PRICING: Suggested retail prices are $27.50 for new construction model and $30.50 for Retro-Fit model. 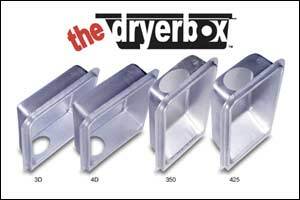 For quantity pricing breakdown or pricing update information, please check online at www.dryerbox.com or call us at (888) 443-7937. DISTRIBUTION: The Dryerbox are available throughout the country from supply houses, lumber yards and hardware centers, as well as online at www.dryerbox.com or by calling (888) 443-7937. (Jupiter, FL - November 2003) In-O-Vate Technologies Inc., who developed The Dryerbox for new home construction, has very recently incorporated a “gas port” to the already popular receptacle that installs in the wall behind the dryer. This simple, yet innovative, product saves space in the laundry room, allows the clothes dryer to operate more efficiently and reduces a common household fire hazard. To-date, over 500,000 units are installed in homes across the country. The gas port, according to Rick Harpenau, President, has been sought after by tradesman from the initial introduction of the recessed dryer vent receptacle back in 1998. According to the Appliance Manufacturing industry, 1/5 of the dryer appliances are gas and require a gas valve and tubing to be installed behind the dryer. The Dryerbox includes enough additional room to facilitate the necessary valve and connection. A common “knock out” type covering will make it easy for the gas tradesman to insert the 1/2” galvanized pipe into the receptacle. Production of the new Dryerbox started in June and have worked their way into the market successfully. The Dryerbox allows the storage and recoiling of the flex transition hose between the dryer and the wall connection to take place inside the wall cavity, eliminating the zig-zag of ductwork most households have tolerated for decades. Similar in function to the plastic receptacle now commonly found behind washing machines to house the plumbing connections, The Dryerbox allows the clothes dryer to be pushed back against the wall of a laundry room, providing an additional square foot of work space and it allows the dryer to be positioned without fear of kinking the exhaust hose. For the air-distribution supplier, it’s not a matter of if you’ll carry The Dryerbox, it’s when! (Jupiter, FL - January 2003) In-O-Vate Technologies Inc. has launched The Dryerbox, a recessed dryer vent box, to the U.S. market. This simple yet innovative product saves space in the laundry room, allows the clothes dryer to operate more efficiently and reduces a common household fire hazard. According to the National Fire Protection Agency (NFPA), clothes dryers are the number three cause of house fires, after stoves and heaters. This is caused by the accumulation of combustible lint in the bends and crimps in the exhaust ductwork behind the dryer. The Dryerbox allows the storage and recoiling of the flex transition hose between the dryer and the wall connection to take place inside the wall cavity, eliminating the zig-zag of ductwork most households have tolerated for decades. Similar in function to the plastic receptacle now commonly found behind washing machines to house connections, The Dryerbox allows the clothes dryer to be pushed back against the wall of a laundry room, providing an additional square foot of work space as well as a more attractive appearance. Additionally, the vent box eliminates the space behind the dryer that so often becomes a trap for dust and lint as well as fallen laundry items. 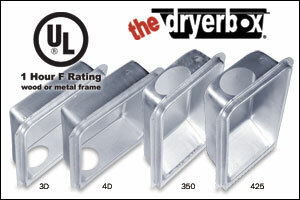 Manufactured through a process known as “deep drawing,” The Dryerbox is constructed of heavy, 22-gauge, aluminized steel. Approximately the size of a medicine cabinet, The Dryerbox installs between the studs in new construction before the drywall phase to house and collect the flex duct hose, which connects to the wall exhaust pipe. It can be exhausted to a roof jack, sidewall or down to a crawl space or floor joint system. The Dryerbox also doubles as a gas connection receptacle. This is facilitated by a newly incorporated "knock-out" hole in the top side of the Dryerbox. Three models are available, including Model 350 (3.5 inches deep for two-by-four framing), Model 425 (4.25 inches deep for two-by-six framing) and The Retro-Fit Box (four inches deep for use in existing homes). The Retro-Fit model is powder-coated, similar to the finish on the dryer appliance, for an attractive appearance. Suggested retail prices start at $19 for new construction models and $21 for the retrofit model, plus professional installation, if needed. The Dryerbox provides a variety of benefits to both the homeowner and building and design trades. In-O-Vate Technologies, Inc, makers of the popular Dryerbox®, announced the addition of a large radius 45 degree elbow to their lineup of Dryer-Ell venting products. Similar to the Dryer-Ell 90, this new elbow will allow contractors to gain additional length of run with no resulting building code penalty. In-O-Vate Technologies, the manufacturer of the Dryerbox and the Dryer-ell, have recently been notified that both products have been “GreenSpec” listed and designated a “Green Product” with LEED (Leadership in Energy and Environmental Design) building credits. In-O-Vate Technologies, the manufacturer of the Dryerbox, has introduced a new, patent pending feature for their popular vent hose receptacle. The Dryerbox will now include a duct support tab in the top port that assists in maintaining the ideal penetration length of 2 inches for Snaplock rigid conduit. In-O-Vate Technologies, the company that invented the Dryerbox®, made this year’s Inc. 500 as one of the fastest growing private companies in America. In-O-Vate exceeded 388% growth over the three-year period reviewed, ranking 359th overall and 16th in the construction related category. In-O-Vate Technologies’ new 90° long-turn dryer venting elbow was recognized for excellence in product design in the third annual Dealer Design Awards Program sponsored by The Air Conditioning Heating & Refrigeration News magazine. In-O-Vate Technologies, Inc. of Jupiter, FL announced the sale of the one millionth Dryerbox unit. The manufacturers of The Dryer-Ell, a re-engineered long-turn dryer exhaust conduit fitting, recently underwent some extensive laboratory testing by Underwriters Laboratories. In-O-Vate Technologies, Inc., a manufacturing company specializing in dryer venting products, recently unveiled the Lint-Alert, an electromechanical pressure switch to be installed in the dryer appliance. Take a look behind your dryer. Chances are the back of it is about five or six inches away from the wall and the vent hose resembles a snake. In-O-Vate Technologies, Inc. adds some serious marketability to its already popular solution to dryer venting by obtaining a one-hour F rating from United Laboratories, Inc. UL is the trusted source across the globe for product compliance. In-O-Vate Technologies, Inc. makers of the enormously popular and practical Dryerbox have come up with another promising new product: The Dryer-Ell. A re-engineered dryer exhaust fitting that exhibits a larger radius and a smooth interior, providing a net gain of approximately 4.8 feet in allowable duct length when used as a replacement to the standard 4” ell used in the dryer venting trade. In-O-Vate Technologies introduced a new version of their popular Dryerbox vent receptacle facilitating a downward exhaust direction. For houses built on stem wall or for second floor laundry rooms, this new Down-Box receptacle provides all the same benefits of their original model. It’s time to air some of your home’s dirty laundry. Even the best-kept house may have a dirty little secret. Lint. It’s more than a matter of cleanliness, but actually a serious fire hazard that may be lurking right under your roof. Why did you come up with this invention? As a General Contractor for 13 years, building custom homes and developing residential communities, I've always been around and cherished construction, engineering and inventing. Have a washer and dryer at home? Good chance the dryer is five or six inches away from the back wall and the flex exhaust hose resembles a snake. “Tight bends in the flex exhaust hose accelerate lint accumulation and can really impair the efficiency of the dryer and—worse yet—create a fire hazard,” says Rick Harpenau, owner of In-O-Vate Technologies Inc. and inventor of The Dryerbox. The Dryerbox was invented and patented in the United States and was introduced to the market in 1995. The Dryerbox is a simple metal receptacle that installs in the wall behind the dryer to house and collect the flex duct hose, which connects to the wall exhaust pipe. In-O-Vate Technologies Inc., who developed The Dryerbox for new home construction, has very recently incorporated a "gas port” to the already popular receptacle that installs in the wall behind the dryer. This simple, yet innovative, product saves space in the laundry room, allows the clothes dryer to operate more efficiently and reduces a common household fire hazard. To-date, over 500,000 units are installed in homes across the country. In-O-Vate Technologies has launched The Dryerbox, a recessed dryer vent box, to the U.S. market. This simple yet innovative product saves space in the laundry room, allows the clothes dryer to operate more efficiently and reduces a common household fire hazard. Fire Research Series: Clothes Dryer Fires in Residential Buildings. Clothes dryer fires account for about 15,600 structure fires, 15 deaths, and 400 injuries annually. When a dryer vent is installed within a wall cavity, the use of a vent receptacle prevents the flexible transition hose from being crushed, thus reducing the possibility of a blockage that could cause a fire. Fires in clothes dryers kill or injure hundreds of people every year. "The volatility of dryer lint is incredible." Tips to Prevent Fires. 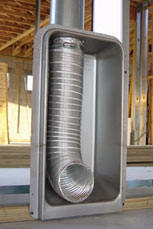 A dryer box is an inexpensive metal accessory that creates back-of-dryer space for the vent pipe. It improves dryer performance by ensuring that the duct work remains uncrumpled. Most people know there's a pipe on the back of their clothes dryer, and that it needs to be connected to the vent pipe that's coming through the wall or floor in their utility rooms. Clothes dryer vents have got to be one of the last things that builders consider when they're putting a house together, and it shows. Take a look behind just about any dryer and you'll see what I mean. Dear Jim: Our dryer runs longer than it used to and the utility room seems chilly. The dryer is pushed back in a corner with a bend in the duct. What can I do, and should I install a vent cover or vent it indoors? — Hank W.
10. The Dryerbox. In-O-Vate Technologies Incorporated a “gas port” to its Dryerbox, a receptacle that installs in the wall behind the dryer. The "At Home" section of the Sunday Columbian features a column by our "Energy Adviser" QUESTION: Dear Energy Adviser: I read your column on venting clothes dryers last fall. 100 products and materials readers wanted to know more about. 9. In-O-Vate Technologies. The 22-gauge aluminized steel Dryerbox is a recessed dryer vent box that saves space in the laundry room because it allows the dryer to be pushed against the wall. Brother Morris' wife, Carol, recently noticed a magazine ad for a stamp-formed metal device that looked a lot like a dishpan with a large round hole in one end. The Dryerbox is a better way to connect a dryer. The Dryerbox is a small idea, but a good one. Very good, in fact. It's made of 22-gauge aluminized steel, drawn deep into a pan shape. Building Products' second annual Most Valuable Product (MVP) Awards. In-O-Vate Technologies. One judge was so impressed by The Dryerbox that he commented: "What a great idea! Why didn't I think of it? Things that make life a bit easier, more profitable and better. 35. The Dryerbox. This box insets behind the clothes dryer between wall studs to accommodate a flexible exhaust hose. Rick Harpenau says his Dryerbox helps make homes safer and saves space. JUPITER — Two years ago, Rick Harpenau quit his job building jails for Wackenhut Corp. to work full time on an obscure invention called The Dryerbox, a metal receptacle that promises to save space and reduce the risk of fire. A wife (my former neighbor) started a clothes dryer in the laundry room, which was located between the garage and kitchen. She then left the house to run errands. 4. The Dryerbox. From In-O-Vate Technologies is a metal receptacle that installs within the wall and facilitates the collection and housing of the flex hose. Every so often, as I wade through the piles of new-product releases that cross my desk, some simple, forehead-slapper of an idea stands out. Recognizing that there can be serious efficiency and safety problems with conventional clothes dryer vents, Rick Harpenau, president of In-O-Vate Technologies (Jupiter, FL), has brought a solution to market.